Andrew Fischer, better known as “Fish,” is an expert at helping golfers of all levels build muscle and increase flexibility in an effort to improve their game and prevent injury. The man behind Fish Fit Golf helped Bubba Watson rise from a middling PGA Tour pro to the Masters-winning, world-beating golfer he is today. Fish, who boasts more than a decade of training experience, focuses on three areas: muscle strength and endurance, heart health, and joint-to-joint, stability-to-mobility training that works on a full-body range of motion. “I try to use the minimal effective dosage principle, where the minimal amount of work gets the most effective gain,” he says. “I’ve dealt with plenty of athletes on the highest level of the PGA Tour and they don’t have much time. It’s 15 or 20 minutes and let’s be done.” Fish, who has an iPhone and Android app, shared five exercises and three stretches that will improve your game and your fitness. This workout is an overall approach that targets specific golf muscles and should be executed three times a week for optimal golf improvement. Stand with feet shoulder-width apart, with your arms by your sides. Step backward with one foot, and drop your back knee down to a 90-degree angle. Raise your arms over your head, and rotate your torso toward your front leg. Rotate back to center, return to the start position, and repeat on the opposite side. These lunges help increase stability and strength in the lower body. The rotation portion of the exercise will hone your ability to rotate your torso around fixed hips. Being able to control both of these will lead to better energy transfer and a proper swing sequence. Lie with your shoulder blades and head on a Swiss Ball, your knees at a 90-degree angle, and your feet flat on the floor. Rotate your shoulders to the right until parallel to the floor. Keep your head and legs pointing forward while you rotate your torso. Return to vertical, then rotate to the left. This exercise increases the stability of your hips while incorporating a rotational component. This will eventually prevent swing deficiencies, such as swaying and sliding, and give you a very solid base to swing from. Stand with your knees slightly bent and your feet a little wider than shoulder-width apart. Jump to your left 3 to 5 feet. Land with your knees slightly bent without allowing your hip or torso to move to the outside of your left foot. Touch your left hand to the outside of your left foot. Repeat, jumping to the right. Touch your right hand to the outside of your right foot. Power within the golf swing comes from your ability to generate speed from the ground all the way to the club head. This exercise will create more power in your lower body as well as provide increased stability. This leads to a stronger swing that results in increased distance. Stand with your legs close together and your toes pointed in at a 45-degree angle. Raise your heels as high as possible. Stand with your legs close together and your toes pointed out at a 45-degree angle. Stand with your legs close together and your toes pointed straight out. This exercise trains mobility and balance simultaneously. You’ll be building leg muscles while also learning to plant your foot firmly into the ground. Face a partner or the wall, holding the medicine ball at chest level. Forcefully push the medicine ball out from your chest, releasing at full arm extension. Since the pelvis remains stable while the shoulders move forward, this exercise builds stability within the core and produces a repeatable, efficient and powerful golf swing. Lie on your back, bringing both knees into your chest. Extend your left leg while pushing out on your right quad with your hands and lifting your head and shoulders off the ground. The lunge stretch helps prepare two of the major muscles activated in the lower back and pelvis. If these two muscles cannot perform properly, back injuries are more likely to happen. Reach behind your head with your right hand and behind your back with your left. Clasp your hands together and hold for 8 seconds. Release, then reach behind your head with your left hand and behind your back with your right, grasping fingers together. 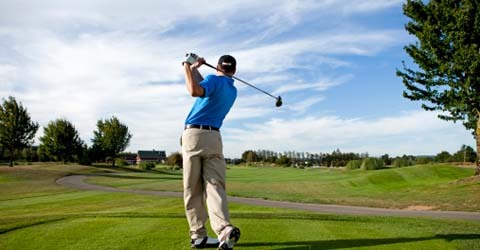 The shoulder is one of the most commonly injured areas in a golfer’s body. A tremendous amount of strain is put into the soft tissues of the shoulder complex when the shoulder blades are not able to move through a full range of motion. Stand with your left ankle crossing your right thigh. While keeping your hips back, bend your right knee into a squat position, while your arms reach forward for balance. : Poor flexibility along the posterior chain (hamstrings, glutes, calf muscles) leads to many swing faults and lower-back injuries. Many players have a problem with maintaining their dynamic posture through the swing and through the impact zone because of a flexibility issue within these muscle groupings. This exercise will increase golf performance and help decrease lower-back and hip injuries.